In the Metropolis Zoo, a monkey glows with a strange light and begins to bubble. Sitting in the Daily Planet, Jimmy draws sketches of the various superpowers he has been randomly developing lately. He runs into Perry who offers him another reporting job, sending him along with Clark. At that moment, Superman is across town foiling a bank robbery. Leaving the crooks incapacitated, he hurries back to the Daily Planet in time to meet Jimmy and head out to Stryker's Island Prison. Jimmy and Clark are there for a hearing for the Kryptonite Man. He tries to prove that his inventions could greatly benefit mankind, and therefore he should be free to perform his research. Jimmy thinks about how he normally isn't aware of what happens after Superman captures the criminals, and he flashes back to an early adventure. When he was just a copy boy there was a gang of engineers that downloaded themselves into robotic bodies. During an attack on Metropolis, Jimmy stowed away on their air car. Back in their hideout, Jimmy waited until they were all asleep. Realizing he had to signal Superman, he used the electronics equipment there to construct a transmitter that sent a high frequency signal. It brought Superman flying and soon the robots were contained. Superman thought that if Jimmy was going to keep getting in trouble, then he would just build him a signal watch using the same technology. Back in the zoo, the monkey glows again and then shoots eye beams. In the trial, the judges conclude that the danger is too great, and the Kryptonite Man will be limited to carrying out his research on paper. This sends the Kryptonite Man into a frenzy, as he begins attacking his guards. The situation causes Jimmy to begin to morph into a werewolf, but before anything can happen Superman takes the Kryptonite Man down with one punch. Jimmy's transformation subsides and Jimmy and Clark head home. That night Jimmy is walking outside when he hears sirens. Running after them he finds a group of gunmen pinned down in a liquor store. Jimmy puts on a mask and leaps forward with his elastic powers. Story - 2: I suppose stories like these are necessary, because they make me appreciate the good stories a whole lot more. This book is definitely a forced Countdown tie-in, and it suffers the fate most tie-in books suffer. It doesn't advance the plot of its own book at all, it references things that you would never know about, and it continues in a different book. All of this would probably be fine if I was actually reading Countdown, but I only made it three issues into that series before I had to drop it. My gripes about crossovers aside, this just really wasn't a great story. The monkey subplot will do something eventually, Titano I would assume, but nothing happened there in this issue. The Kryptonite Man story was just cliche. It would be far more interesting to have the Kryptonite Man actually introducing his Kryptonite technology into hospitals, and worrying Superman with it, than it is to have him go on a standard villain rampage. The flashback story was boring and largely pointless. We already had a perfectly good origin for the signal watch in the World of Metropolis miniseries, but I'll just lump that under New Earth confusion and move on. The idea of a gang of drunk engineer robots is actually a pretty good one, but this little side story wasn't given enough space to use it to any real satisfaction. So instead we were left with something that just takes up space. The only intriguing part of this issue was Jimmy's transformations. I've always had a soft spot for the silver-age Jimmy that was turning fat, or stretchy, or into a porcupine. I loved when Jimmy went stretchy back in the early 90s (or was it late 80s) following Superman's return from space. So I'm all fine with the return of Elastic Lad. Of course, this is evidently happening in Countdown, so all we're seeing is bits and pieces in the comic that should feature Jimmy Olsen as a prominent cast member. I could keep griping, but it basically boils down to the fact that it was a lousy story, and even if it had been a good one, it still would be an annoying tie-in to a book I'm not reading. I know you need to make money DC, but please just let me enjoy my Superman books without expecting me to be reading your weekly series. Art - 3: I'm giving a score of 3, which is 'average', but I feel like that's being very generous. Walker's not horrible, but he certainly shouldn't be working on a flagship title like Action. Some of his stuff is decent, like his Kryptonite Man, but other material is just ugly. 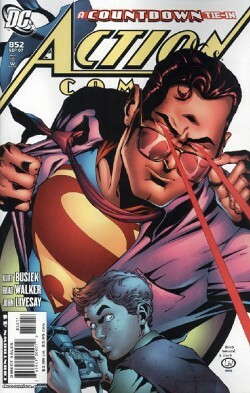 His Superman, the star character of the book, is horrible, and most of his facial work is pretty bad too. I did like the last panel with Elastic Jimmy, but anything good about that scene is completely ruined by the completely hideous splash of Superman taking out the Kryptonite Man. That's enough complaining from me on that. I really don't think his work is bad, it just didn't turn out in this book. Cover Art - 3: Pretty boring cover. Jimmy looks dorky, and not in the endearing way that he's supposed to. The Superman is actually very well done, easily Walker's best work on this issue, but even his good work there cannot drag this generic cover above an average. It's just too bad that Walker's interior work on Superman didn't look like that, because I would have enjoyed the issue a lot more then.